The Hale Haven peach (Prunus persica or Halehaven) is characterized by fuzzy orange skin heavily marked with red. Plump with juice and a delicious flavor, home orchard enthusiasts enjoy growing this peach variety since it does not grow too large and is among the most cold-hardy. 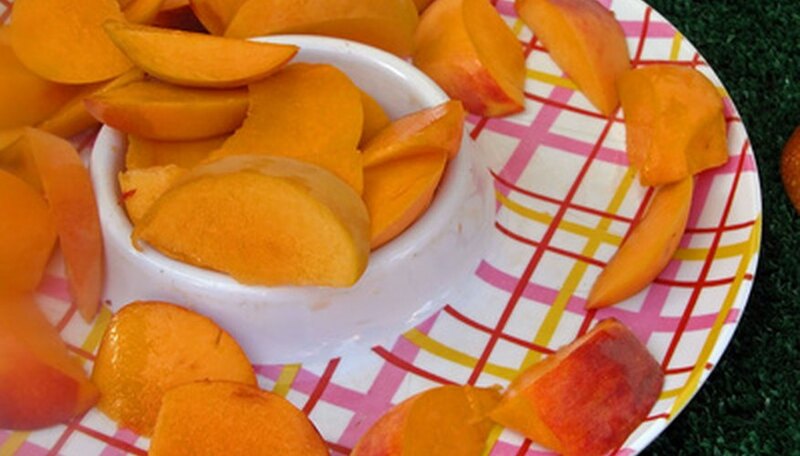 Peaches originated in China, but spread to many parts of the world's temperate regions over the centuries. The Hale Haven peach is a man-made hybrid from the United States, the result of crossing two varieties of peaches: J. H. Hale with South Haven. While standard peach trees quickly grow to a maximum size of 25 feet tall and wide, Hale Haven is a semi-dwarf, reaching a mature size of 12 to 18 feet tall and slightly less in width. Its pink flowers occur in early to mid-spring. The fruits develop across late spring and early summer. Regarded as a mid-season peach, Hale Haven develops many medium- to large-size peaches with firm and juicy flesh inside red skin. It is a freestone type, meaning its stony seed core readily pulls out from the flesh. The tree's flower and leaf buds demonstrate excellent winter hardiness, ensuring little damage from late winter cold or winters of long duration. Hale Haven peach trees should be planted in a full sun location in the garden, receiving no less than eight hours of direct sunlight daily. The soil must be fertile and moist, but drain well so that roots never sit in soggy or flooding conditions after natural rainfall. The trees can be grown in USDA Hardiness Zones 5 through 8, or in Sunset Climate Zones 1 through 3; 6 through 11; and 14 through 16. Peach trees require a bit more pruning than other fruit trees. To encourage production of fruits across the full tree canopy rather than just on the sagging branch tips, prune back branches by one-third in late winter to retain flowers and to encourage new side branches that will produce flowers next spring. Planting more than one tree increases pollination by insects, even though Hale Haven is regarded as self-fertile. Removing some fruits when only 1 inch in size so that developing fruits remain spaced about 8 to 10 inches across a branch allows them to grow to their fullest size and flavor potential. Two fungal diseases of concern on peaches include peach leaf curl and brown rot, both managed with application of dormant sprays in winter and maintaining a clean orchard. In a landscape design context, the Hale Haven peach acts as both an ornamental flowering tree as well as fruit tree. The fruits of this variety make fresh table snacks and also keep their firm flesh and flavor well when canned.